You play the trigger happy Sheriff running wild in a local saloon, guzzling down whiskey and shooting at flying objects. 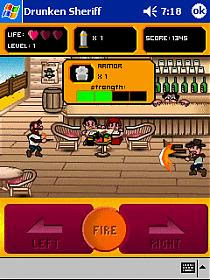 The bartender starts to throw things across the bar to let the Sheriff practice his sharp-shooting skills. Now this errant behavior does not please the saloon patrons one bit! They'll start to throw fruits at the sheriff and if it hits him, he'll suffer from head injuries resulting in a loss of one life points. Simple? Good because it gets better! The Baddest guy in town, Billy, will pop by the saloon to say "Howdy!" to the sheriff, which in turn will result in a hostile gunfight in the saloon. The sheriff has to defeat this guy to proceed to the next stage! Outraged by his defeat, Billy the Bad throws in sticks of dynamite in to the saloon in an effort to blow the sheriff into pieces! This is where the Sheriff has to avoid shooting dynamites as he shoots the things the bartender throws at him. After some time, Billy the Bad comes back, this time with a super strong Armor! You're gonna need some silver bullets and lots of prayer to defeat this guy! He's not gonna go easy on you!